2Spread out the tomatoes and garlic on a rimmed baking sheet; drizzle with oil and season with salt and pepper. Roll the tomatoes around with your hands to coat them. Roast for half an hour, or until they release some of their juices and start to darken. Scrape the lot into a baking dish. 3To make the biscuits combine the flour, cornmeal, baking powder, baking soda and salt. Add the butter and blend with a pastry cutter, whisk, fork or your fingers until the mixture is well blended and crumbly. Add the sour cream and milk and stir just until you have a soft dough. 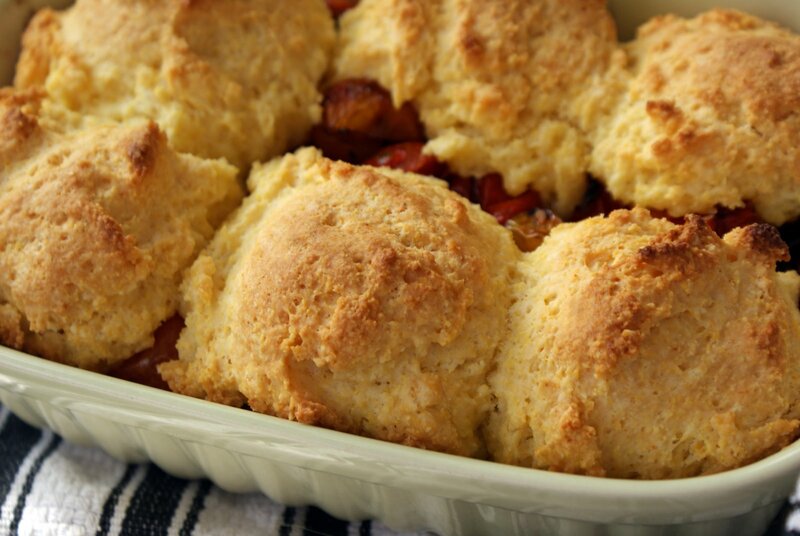 Drop the dough in large spoonfuls or shape into rough biscuits with your hands and place on top of the tomatoes. 4Bake for 40 minutes, until the biscuits are golden.